The year is 1868, and the world has barely started to adjust to the shockwaves caused by the publication of Charles Darwin’s On the Origin of Species. Fourteen-year-old Faith Sunderly and her family are fleeing Kent, the place where Faith has lived all her life. When The Lie Tree opens, Faith’s on a boat to the island of Vane, allegedly so her father can look at a new excavation there. However, Faith knows there’s more to it than that: the Reverent Erasmus Sunderly, a natural scientist, has become involved in a scandal of some sort. Rumours about forged fossils abound, and Faith knows her parents and uncle are worried that the social backlash might follow them to Vane. Once they arrive, though, the scandal becomes only one among Faith’s many concerns. Her father is acting strangely, and Faith suspects there’s a link between his behaviour and a mystifying specimen in a box vaguely labelled as “miscellaneous cuttings”. As the mystery deepens, and as Faith’s life changes irreversibly, she knows it’s up to her to get to the bottom of the matter and to make sense of her father’s relationship with a plant known as The Lie Tree. The Lie Tree seems tailor-made for me and my interests: it’s about the Victorians, gender inequality, early palaeontology, girls with an interest in science, and small island communities with a touch of magic. If that seems like a checklist of things I’d read a novel about, well, it’s because it pretty much is. You can imagine the depths of my excitement, then, when I found out that one of my favourite authors was going to publish a novel that dealt with all of these things. I’m very pleased to report that The Lie Tree didn’t disappoint in the least. I’d say that The Lie Tree is not like Hardinge’s other novels, but then again her other novels are not necessarily much like one another either — her versatility is one of the things I love about her work. 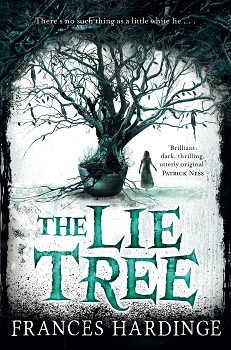 Still, what struck me about The Lie Tree was first of all the fact that the fantastic elements are so subtle. They’re present, but this novel belongs more to a Victorian-Gothic-with-clear-social-subtext tradition which put me in mind of the likes of Wilkie Collins and Mary Elizabeth Braddon. Secondly, of all of Hardinge’s novels to date it’s probably the one most overtly engaged with feminism, which needless to say I loved. The sensibility was always there in her work, but The Lie Tree tackles sexism head on. There was hunger in her, and girls were not supposed to be hungry. They were supposed to nimbly sparingly when at table, and their minds were supposed to be satisfied with a slim diet too. A few stale lessons from tired governesses, dull walks, unthinking pastimes. But it was not enough. All knowledge — any knowledge — called to Faith, and there was a delicious, poisonous pleasure in stealing it unseen. Heartbreakingly, she endures conversations like this because at least it means someone is discussing science with her — someone is giving her crumbs of information she can use to placate her constant hunger. Faith has also learned how to behave during these conversations: she must listen and nod along and be polite and never, ever reveal how much she knows, especially if doing so exposes a lack of knowledge in the man conserving with her. Victorian gentlemen, Faith realises, don’t like women to be more knowledgeable or intelligent than they are, especially not young ladies like Faith. If she accidentally reveals her intellect, she risks having even these crumbs of engagement taken away. Smothering her sobs with one hand, Faith nodded. She hated herself for nodding. But the light on the beach was dying. Her self-respect had suffered a head-on collision with love, a clash that generally only ends one way. Love does not fight fair. In that moment her pride, the gut knowledge that she was right, even her sense of who she was, meant nothing, faced as she was with the prospect of being unloved. I read this scene in the context of all my recent thoughts about how support is essential to any act of resistance to a hostile environment. Faith could probably not repress the gut knowledge that she was right in the long-run, but it’s no wonder that the threat of isolation and of the withdrawal of parental love were enough to make her nod along. It’s much, much harder to be defiant when you’re on your own — without at least one person standing by you no matter what, all of us are likely to succumb to love’s dirty fighting. Myrtle Sunderly’s main concern is making sure her family have a roof over their heads. The novel is set a few years before the Married Women’s Property Act was passed, which of course means she doesn’t have much in the way of legal recourse. The game is rigged, and her only hope is to play by its rules. Who had they been, all these mothers and sisters and wives? What were they now? Moons, blank and faceless, gleaming with borrowed light, each spinning loyally around a bigger sphere. ‘Invisible’, said Faith under her breath. Women and girls were so often unseen, forgotten, afterthoughts. Faith herself had used it to good effect, hiding in plain sight and living a double life. But she had been blinded by the exact same invisibility-of-the-mind, and was only just realising it. Perhaps she would go abroad to visit excavations, and be despised as a scandalous woman travelling alone. Perhaps she would marry, and have all her work attributed to her husband, like Agatha. Perhaps she would end up a penniless old maid, with only a coral collection for company. And perhaps some other later girl, leafing through her father’s library, would come across a footnote in an academic journal and read the name ‘Faith Sunderly’. Faith? she would think. That is a female name. A woman did this. If that is so… then so can I. And the little fire of hope, self-belief and determination would pass to another heart. Faith’s world remains one where possibilities for girls and women are extremely narrow, but there’s hope to be found in the cumulative effects of the lives that enlarge them. How fantastic! I actually just bought this as a nookbook yesterday, so I'm thrilled to see your review. I was utterly sold with that first line you shared. And only became more eager to get in my hands as I read the rest of your review. How eager? I just went and bought the ebook before I even typed this comment. Telling myself that I have to finish some of these library books I have out before I start it, but I'm not sure I have that level of willpower. This sounds great! I haven't heard of it before, so thank you for sharing. SIGH, this sounds marvelous. I can't tell if it's going to be published in the US! I want it to be! It seems like there is a significant lag, though, between UK and US pub dates for Hardinge's books -- didn't The Cuckoo Try come out on your side of the pond at least a year ago? I'm pretty ashamed to say I have never read anything by Francis Hardinge but I've heard only good things. What a great review, Ana. Going to put this on my to-read list.